I feel like at this point she’s put such a tremendous investment of her time and money into her mission that somebody should put her in touch with Oprah. Or at least a person who’s making a documentary about wannabe talkshow guests. “I am very, very blessed,” said Jazz Ison Sinkfield, a mother and grandmother with a story to tell. The southwest Atlanta woman expects her story to make her famous, allowing her to share what she calls her divine gift. The gift: Sinkfield’s fingernails. They represent an ongoing project of 22 years. The longest of them is 24 inches. Occasionally, she said, people see her nails and make ugly remarks. “The women will turn their nose up to me,” she says. “Some people are jealous,” she adds with utter seriousness. 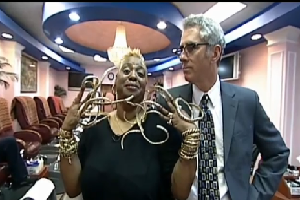 Sinkfield backs her fashion statement with regular visits to the Exotic Nail and Spa on Cascade Road. Her nail tech is Rose Nguyen. Her maintenance is a monthly project that takes five hours and costs $250. “It’s easy to get messed up,” said Nguyen, looking at her client’s twisting fingernails. “They tangle up,” said Jazz Ison Sinkfield. And maintenance is also about avoidance of the hazards that can threaten her ongoing fashion statement. “There isn’t anything that I can’t do. The only thing I can’t do is, I cannot tie shoes,” said Sinkfield. She adds she cannot type on a computer, nor go bowling. “Of course, I don’t take off the jewelry,” she said, gesturing to her rings and bracelets, which would have to traverse her 20-inch nails to come off.